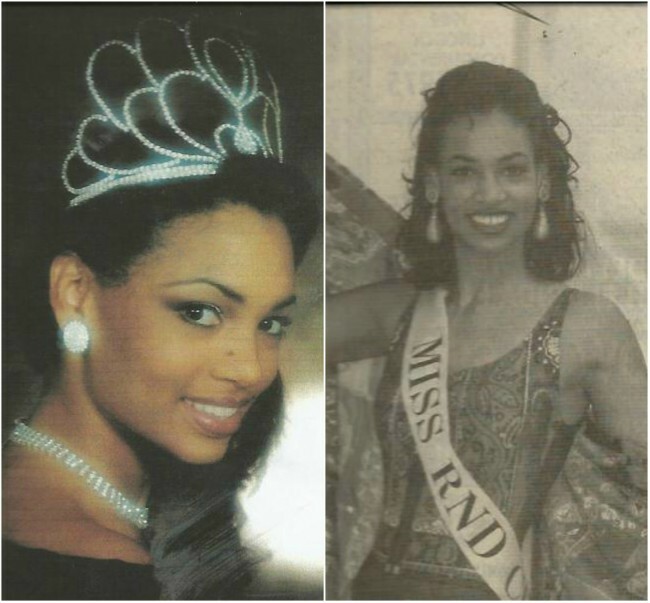 The new owner of Miss Bahamas Universe, Michelle Collie as seen 'back in the day' as a pageant queen herself. Collie was Miss Bahamas 1995 and competed in the Miss Universe contest in 1996 in Las Vegas. She was also a semi-finalist in Miss Model International. In 1961 the Bahamas Pageant Committee was formed by a group of civic minded women who where well respected in the community. In August of 1961 the first Miss Bahamas contest was held with Brenda Barry (nee Major) being crowned the winner. The intent was to give Bahamian women a platform to express themselves. In 1962 after a visit from the founder of the Miss Universe contest Mr. Bottlefield and the reigning Miss USA Marcel Wilson of Hawaii, the Bahamas Pageant Committee became enfranchised by Miss Universe. As a result of this their was no Miss Bahamas contest in 1963 and Sandra Louise Young became the first Miss Bahamas to compete in the Miss Bahamas contest. Bahamian women have competed in the Miss Bahamas contest every year since 1963, missing only the years 1973 and 1984 making The Bahamas one of the most consistent countries in sending a representative to the Miss Universe contest. Over the years the Miss Bahamas contest was one of the biggest events of the year with some of the top names in the entertainment business performing,and some of the most prominent people in society, as well as international celebrities served as judges. At the 1995 Miss Bahamas contest Sir Sidney Poitier was honoured. In the 1960's the contest took the form of a dinner dance. The Miss Bahamas winners went on to lived charmed lives. The Bahamas Pageant Committee held the Miss Universe franchise until 2000 with their final Queen Nakera Symonette (nee Simms) walking away with Miss Congeniality award. In 2000 Gaynelle Rolle acquired the Miss Universe franchise holding the franchise until 2009. In 2010 MBO Miss Bahamas headed by Michelle Malcolm and Jerome Sawyer acquired the franchise which they held until 2015. In 2016 a new organization headed by Ivy League Limited acquired the franchise, and the Miss Universe Bahamas 2016 will take place on Saturday, September 17th at the Albany Resort Aviva Beach Western in New Providence. The winner will receive a deluxe prize packages which resembles prizes received by the Queens under the Bahamas Pageant Committee including a trip to Miss Universe all expenses paid, an official car for use during her reign, and a complete wardrobe. New additional prizes include a Ten Thousand Dollar Cash Prize, a year's membership at Albany, a $50,000 appearance contract , and she will also be the official hostess of the Hero World Challenge PGA Tour. The Deadline for entries is July 2nd 2016. You can follow Miss Bahamas Universe2016 at www.missbahamas-universe.com at their Facebook page Miss Bahamas Universe. Michelle Collie who spearheads the new Miss Bahamas Universe group is no stranger to pageants, as she was Miss RND Cinema's and captured the Miss Bahamas 1995 crown. Michelle competed in the 1996 Miss Universe contest which was held in Las Vegas Nevada, where she made it into the top ten. She was also a finalist in the Miss Model International contest. The Miss Universe Bahamas 2016 contest will hold a traditional preliminary contest as has been the case in past pageants and will also feature a popular pageant tradition in The Bahamas, the National Costume Event. The girls selected to compete will undergo a 7-week training exercise that will include sessions in choreography, stage walking, public speaking, style and beauty etiquette, along with fitness and nutrition. This years contestants will embody beauty class and sophistication. One thing that has always been noticeable, is that Bahamian women are world class beauties, and are just as beautiful as women in other countries. It is said every year, that the girls keep getting better and better, and The Bahamas certainly has some of the most natural beauties in the world. It is only a matter of time before this beautiful archipelago of 700 Island produces a Miss Universe winner.